Life in Pieces is an American 30 minute scripted family television series, which kicked off on September 21, 2015, on CBS and is broadcast every Thursday at 21:30. The show is currently in its 4th season. 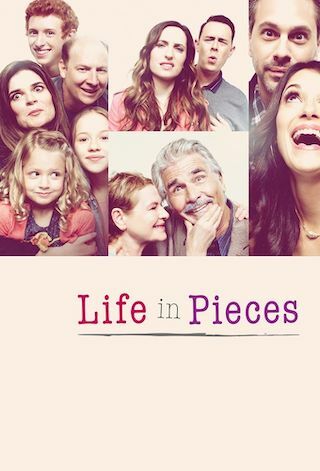 CBS has officially confirmed the renewal of Life in Pieces for Season 5. The exact release date is yet to be announced so far. Sign up to track it down. Life In Pieces is a single-camera comedy about one big happy family and their sometimes awkward, often hilarious and ultimately beautiful milestone moments as told by its various members. Of the three siblings, middle child Matt may have just found his true love, his co-worker, Colleen; his coddled youngest brother, Greg, and his wife, Jen, are overwhelmed by the birth of their first child; and the eldest, Heather, and her husband, Tim, are dreading their impending empty nest so much, they're considering having another baby. Their parents are Joan, the family's adoring matriarch who would do anything for her kids - as long as she agrees with it - and John, the gregarious patriarch who's searching for ways to soften the blow of turning 70. As the family's lives unfold in four short stories each week, they try to savor these little pieces of time that flash by but stay with you forever, because these moments add up to what life's all about. After Tim has a heart attack, he becomes super clingy and annoys the entire family. Also, Greg and Jen make a pact to keep their baby's gender a secret; Sophia's new pet frog turns out to be a dangerous species; and Matt and Colleen receive news about their impending adoption.